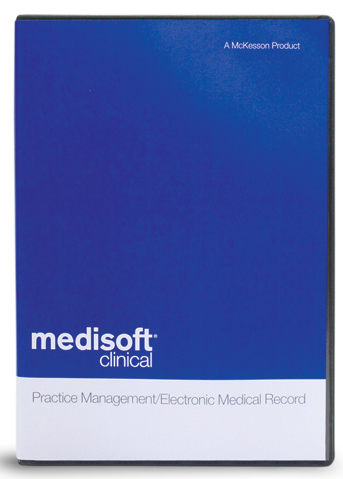 Medisoft Clinical EHR: With the latest Medisoft release, McKesson now offers Medisoft Clinical, a complete practice management/electronic medical record (PM/EMR) solution that works seamlessly together to minimize practice disruption. Our software combines the practice management features of Medisoft with a fully functional EMR at a price point geared to smaller physician practices like yours. With Medisoft Clinical, you get the latest in practice automation without a lot of hassle and at a price you can afford. Unlike other EMRs, Medisoft Clinical features Bright-Note Technology, a unique note-centric design that allows physicians to complete the entire chart from the progress note. Any information you add to the note — such as medications, vital sign results or lab results — automatically update the entire chart, all from the note. Electronic prescribing (via SureScripts® and RxHub®) improves patient safety and speeds new prescription and refill workflow. Medisoft Clinical uses thousands of prescription templates and a comprehensive database of drug costs and checks — drug interaction, drug/allergy, drug/disease, drug/diagnosis — in addition to proactive dose advice. Medisoft Clinical's E&M Wizard will analyze the note with a sophisticated coding advisor for Evaluation and Management (E&M) codes using both the 1995 and 1997 CMS Documentation Guidelines to optimize coding based on documentation. Our software will load transcribed text and populate the entire patient chart including the problem list, medication list, medical histories and vital signs. You can also partially dictate a visit and have the transcribed text automatically go to the correct place in the note. Medsioft Clinical can also import and export chart summary data using CCD or CCR formats allowing it to communicate with other practices’ EMRs or with the patient’s personal health record (PHR). When importing data, you can choose which chart sections to update while still keeping an entire copy of the imported document. Medisoft Clinical also includes a document management system for scanning and electronically managing your paper charts and images. *‘Full Suite includes Medisoft Clinical EMR, Medisoft Network Professional, Office Hours for Networks, Clinical Templates and content; you only need to choose the number of users that you would like to have access to Medisoft. Pricing does not include Software Assurance, Training, or Support.